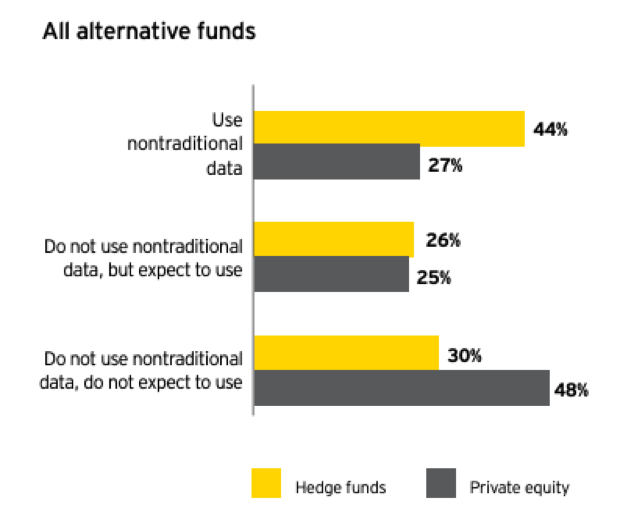 EY Survey: The company surveyed 205 asset managers (hedge fund and private equity representatives), interesting findings include: 1) 70% of all asset managers use or expect to use nontraditional data sources in their investment process; 2) 59% of surveyed managers use alternative data as an input to their fundamental approach; 3) 88% of hedge funds with AUMs over $10bn said they invest in data engineering and sourcing. Use Cases Report: we published a 124-page report regarding the use cases of alternative data. It’s the sixth of a series of reports published by Eagle Alpha where we detail the best applications and case studies of alternative data, based on our six years of experience. Download it here. NYC Conference: our “access and alpha” conference is next Thursday. JPMorgan is the lead sponsor and the keynote speaker is Vasant Dhar. There are only 12 tickets left and 671 1-on-1s are already booked for just 25 hand-picked vendors. 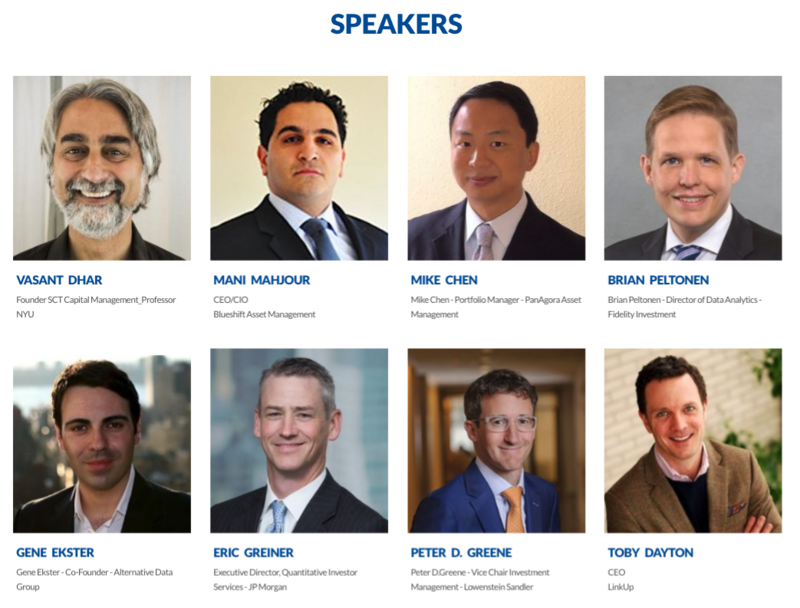 To learn more and register visit our new website – https://events.eaglealpha.com. Roadshows: a social media data vendor is meeting funds in NYC on November 27th & 28th. This vendor captures the social media actions of more than 2 billion consumers and parses them across 700+ metrics into its global taxonomy of over 475,000 brands, publishers, TV shows, influencers, and celebrities going back to January 2013. For more information contact mark.vaughan@eaglealpha.com. Quant: this vendor provides an accurate view of the impact and efficiency of an enterprise’s investment in innovation. The company also developed an index that can be used to differentiate groundbreaking patents from unimportant ones. Our Data Sourcing clients can view the full profile here. Discretionary: this vendor measures consumers in the US and the UK on every device, app, site, service and platform they use throughout the day, both online and offline. They passively collect cross-device user behavioral data and panelist demographics and other background data. Our Data Sourcing clients can view the full profile here. New: this vendor provides the dataset for the 80 key destinations visited by Chinese outbound travelers, 36 in Europe, 21 in Asia, 10 in the Americas, 9 in Africa and 4 in Oceania. Our Data Sourcing clients can view the full profile here. Open sourcing this week: nbformat – this lesser known part of the Jupyter notebook ecosystem allows you to programmatically create Jupyter notebooks. Have a style convention or standard content you want to present in the Jupyter notebook medium? This library allows you to build a notebook with code and markdown cells using a simple python API. What we’re reading this week: Training Sequence-to-Sequence Models to generate Github issue titles – this in-depth tutorial provides code and an full explanation of the steps involved in building a sequence-to-sequence encoder-decoder model to ingest Github issue body text and output a summarized title. The article goes through how to get the Github issue dataset, cleaning the text data, training the model, and a sample of results using the model. It also touches on alternative uses for the model such as finding the most similar issues to a given issue. Useful applications in the financial industry would be document summarization and topic inference in news or other natural language sources. Efficiency Improvements – Standardized Metadata: contact dataforum@eaglealpha.com to get access to the first document standardizing the metadata schema. Best Practice – Survey: in November we are surveying clients regarding compensation packages for the different roles associated with alternative data. To learn more contact dataforum@eaglealpha.com. Increase revenue: we are launching several new features to help alternative data vendors succeed. To learn more email our CEO – emmett.kilduff@eaglealpha.com. Dashboards: to help you access traditional fundamental investors we are building customized dashboards on top of alternative datasets. Contact us to learn more at enquiries@eaglealpha.com. Funding: if your firm is seeking to raise capital contact us – we can help. Email: enquiries@eaglealpha.com. The rise of ‘quantamental’ investing: where man and machine meet. The Impact of Artificial Intelligence on the World Economy. Alt data still lacks ‘user friendliness’.